13. Something you always think “what if…” about. 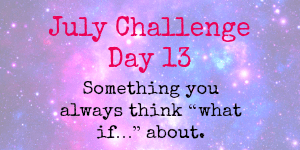 My biggest “what if…” is always at the back of my mind. If I had never sold my flat would I still have met Lee and persuaded him to move to Canada with me. I literally signed the paper on the sale the week before I met him as it had an original sale that fell through so I had to re-list and wait again. If I had just took it off the market and waited we could have been in a much bigger flat than we are currently and it would be perfect for all the kids. But then I wasn’t to know I was going to fall head over heels in love with him after our first date and that is what changed the goal posts for Canada.